A group of ‘urban explorers’ who climbed more than 200 feet up the chimney of a Preston mill were today branded “idiotic”. The men waited until the dead of night to avoid attracting the attention of the police, building security and CCTV, and appear to have taken almost no safety measures before making their ascent. 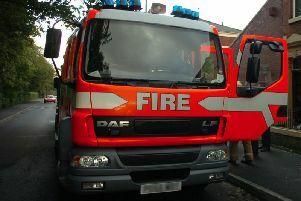 Coun John Swindells, the deputy leader of Preston Council, said: “I think it is irresponsible to go up buildings. Even when there are ladders there does not mean they are actually secure. Coun Javed Iqbal, who represents the St Matthews ward on Preston Council, which covers Centenary Mill, said: “People live in these flats and they don’t want any of this. It is anti-social behaviour really. The group of three are identified on the website only as Ojay, Bigjobs and Over. In a thread on the forum one of the group, Ojay, describes the moment they climbed the chimney. He said: “After a bit of planning and packing we were sneaking about the mill dodging CCTV and security at stupid o’clock to get to the chimney. “It wasn’t long before we had ascended up to the first section of the chimney before Over disappeared into the yonder to set up rope. No one from Newcastle firm Avoca, which manages the building, was available to comment.